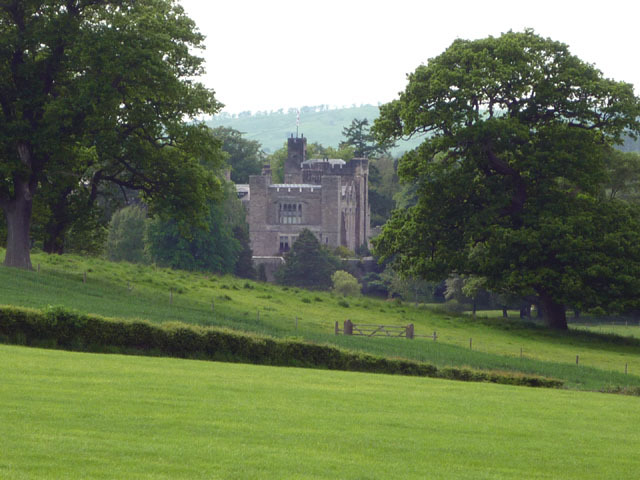 Notes: Thurland Castle is a former country house, surrounded by a moat, and located in parkland between the villages of Cantsfield and Tunstall, Lancashire, England. It is recorded in the National Heritage List for England as a designated Grade II* listed building. The castle stands on a low mound on a flat plain, with the River Greta on the south side and the Cant beck to the north. A deep circular moat surrounds it. The earliest existing fabric dates from the 14th century, and in 1402 Sir Thomas Tunstall was given a licence to crenellate the building. Following Sir Thomas' death in 1441, the castle passed on to his son Thomas, and then later to his brother Richard, a hero of the Battle of Flodden in 1513, who was dubbed the "Stainless Knight" by the king and immortalised in the poem Marmion A Tale of Flodden Field by Sir Walter Scott. Bryan's son Marmaduke was High Sheriff of Lancashire for 1544. After two or three further generations of Tunstall's the castle was sold to John Girlington in 1605, and passed to his grandson, Sir John Girlington, a Royalist major-general during the Civil War.The castle was badly damaged by Parliamentarian forces during a siege in 1643, following which it was described as being "ruinous". Sir John's son, also John, was High Sheriff of Lancashire for 1663. Work was done on the building to convert it to a country house in 1810 by Jeffry Wyattville, and in 1826-29 by George Webster, but in 1876 it was gutted by fire. The owner, Mr North North, commissioned the Lancaster architects Paley and Austin to rebuild it, and what is now present is mainly their work.Work began in 1879, over 100 men were employed, and it was not completed until 1885.The house and stables have since been converted into several luxury apartments.